Installing a new floor is an exciting process for the homeowner. No where else in the home can such a dramatic effect be achieved than a properly installed hardwood floor. Our installation process is unsurpassed in quality and thoroughness and we take pride in every job we do. Consultation with the client to determine wood species, borders, inlays, colors, and other design consideration with our experienced and knowledgeable designers. Sub-floor preparation including leveling, fastening and verification of structural integrity. Ensuring that climatic conditions on the job site are suitable to wood species used and that lumber stock is adequately cured prior to installation. Installation of hardwood using high quality fasteners and intensive quality control. Sanding of new floor to level and provide a smooth even surface for finish and walking. Stain and/or clear coat to desired tint and sheen. Zone maintenance of new floor to ensure high quality finish throughout the life of the floor. Wood flooring can be a great asset to your home. It is very neutral in color and style, which makes it easy to decorate around, and it always compliments the current decorating trends. In addition to enhancing your home’s beauty, wood floors raise the value of your home. So refinishing your wood floors is a process well worth your time. Request a quote. Repairing damaged boards that are beyond restoration, filling in areas under carpet, tightening down boards to reduce squeaks and pops, and any other task that requires carpentry work prior to the restoration process falls under the category of repair. Repairing a wood floor is an art form that requires great skill in order to create a seamless transition from the repaired area to the rest of the floor. Matching the wood species, grade and cut can often be tricky and may require special order for older floors. We will give you a ballpark hourly price on repairs but realize that due to a variety of factors including wood type, sub floor condition and extent of repair job the time it takes may vary. If we find that your floor is going to take longer than we anticipated we will let you know immediately. We use professional grade sanders to mechanically remove all of the existing finish off of your floor in addition to oxidized surface wood. Our sanding job’s are free of machine marks and always tight to the edges and corners. We use a professional dust containment system that eliminates 99% of airborne dust, and thoroughly clean all surfaces upon completion of the sanding job. We take pride in our ability to restore almost any wood surface, and it is part of our environmental mission to due so and reduce the amount of trees that need to be cut down. * No swirl marks from edging, or drum marks. * Corners will be scraped and sanded to seamlessly blend with the rest of the floor. * Stairs, vertical surface and railings sanded to perfection. * Highest quality paper giving you the smoothest possible finish. We use only state of the art finishing processes and techniques to make sure your finish goes on smooth and even and remains hard and durable throughout its life cycle. 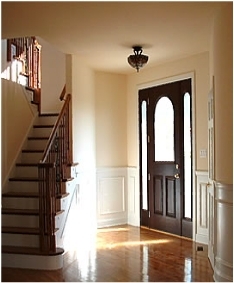 We use top quality professional grade clear coats and stains. We have extensive experience in the application of water and oil based modified urethanes, varnishes, and other common types of clear coats. Products we use include basic, bona, duraseal, and other state of the art fine finishes. We also offer a full line of earth friendly coatings. We believe in setting the client up for success with their new floor. Every floor we finish, whether it’s a restoration or new installation of some of both is put on a maintenance program in order to keep the finish looking good and protect the wood for the life of the floor. Remove all furniture from area to be re-coated. Damp mop area to remove ground in dirt and other debris. Screen with orbital buffing machine to further clean and create toothe for new coat to adhere. Apply new coat to match existing sheen and base (oil/water) of existing top coat. 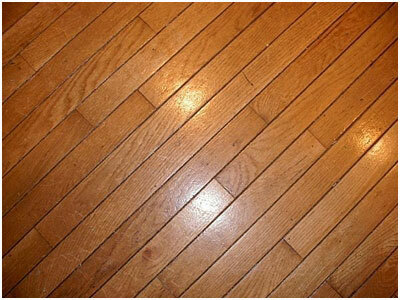 The number one cause of wood floor deterioration is lack of cleaning or improper cleaning. We use zone maintenance in order to save you money and avoid unnecessary recoating in low traffic areas. Entryways, kitchens, and other high traffic areas should be re-coated every 4 years, other areas can go as long as 10 years. Proper cleaning is essential to keeping your hard wood floor healthy and performing at the highest possible level. * Use only approved cleaners in order to not deteriorate the final coating. * Clean often to avoid dust and debris buildup that can act as an abrasive on your floors finish and wear it down and dull the finish.